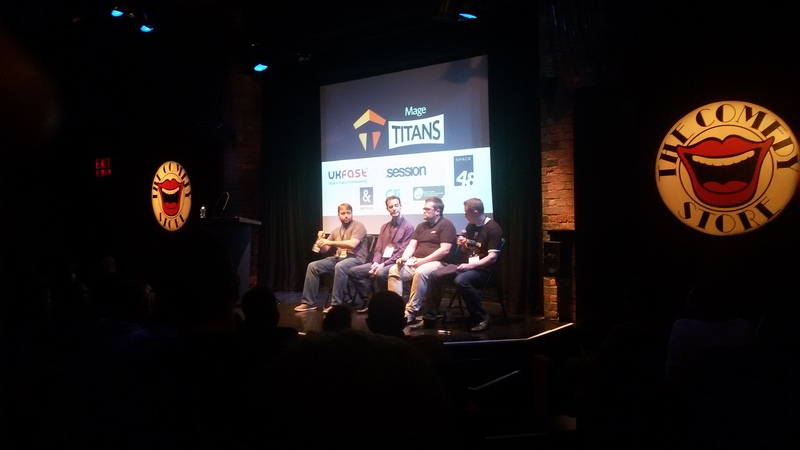 I have just been to my first Magento conference a week ago and another great conference took place just a few days after, this time in Manchester. As there have already been some reviews I will try to focus on interesting points of each talk in this review. The speaker lineup for this event was awesome and the fact that the company I work for – Space 48 were co-organizing the event were enough to make me book a 2.5 hour flight from Budapest (400 kilometres from where I live) to Manchester. The city itself is very interesting and has it’s unique atmosphere. The conference venue “The Comedy Store” was a good choice and it was not too far from my hotel, so I took a walk on a nice sunny day. After hanging around with my colleagues from company, we headed to to the main room. Jon Wodall the Founder and Managing Director of Space 48 gave us a brief introduction after who Jonathan Bowers from UK Fast gave his talk and played a Kids Code Club video clip that everyone enjoyed. 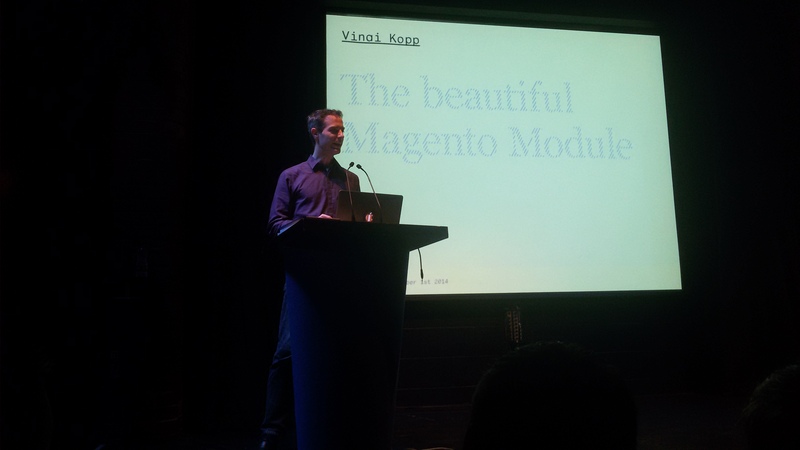 After these introductory talks, the first one was a well known Magento community leader Vinai Kopp with his talk labeled – The Beautiful Magento Module. The title itself sounded promising to me and I was right, it was one of the most useful and informative talks. At start Vinai gave us some facts about Magento and explained some recognized principles in programming world. One group of of these principles was SOLID. The one principle from SOLID Vinai especially wanted to talk about was the Open-Closed principle that has it’s implementation in Magento. Many interesting points were mentioned here, the most controversial ones were that you should not write too many comments, but a self explanatory code which doesn’t need many comments and that you should actually use private methods in your modules (opposite to core Magento). At the end Vinai recommended the book Clean Code by Robert C. Martin. The next talk was Scalable and highly available data in Magento by Alistair Stead. What I memorized the most is that actually more servers is worse if database is the bottleneck of your application. Some terms were introduced such as performance, scaling and redundancy. What I liked about these talk is that there were some concrete advice that could improve your Magento application in form of “8 steps to performance”. Amongst these were adding MySQL indexes, caching, reducing write operations. The most interesting one in my opinion was “Only modify state on HTTP POST request” which is a simple rule that can lead to better performance and to better application organization in my opinion. Another thing I did not know is that MySQL actually can be upgraded with zero downtime. Turning off automatic security upgrades and allocating enough RAM were also useful points. After a lunch which was great there were some lightning talks which lasted around 15 minutes each. The first one was Space 48 CTO Tony Brown with his talk Magento Cache Tags and Debugging. It was a nice story of fixing a real life problem and how loading model in a loop caused additional unnecessary cache tags to be added. The next one was Extending Magento with Backbone.js by Yousef Cisco of Ampersand company. This talks was mostly about Backbone.js and how Yousef and his team implemented it on a real project. There are some benefits from moving your logic to client side and one of these is making Varnish caching easier. Another feature that was presented was a bundle product configurator that worked on client side as well. One of the talks that gained much interest was Separation of Code and State by Rick Steckles. Apparently, Rick and his team have developed a mechanism which provides the ability to have different sample data over various application phases (development, staging, production) with standardized configuration. That data is kept in YAML files (similar to what EcomDev have done with fixtures for their testing framework) and that data is applied to different stages of application. The talk announced as 4th talk was Why you shouldn’t be a Magento developer and it was supposed to be held by Matt O’Connor. 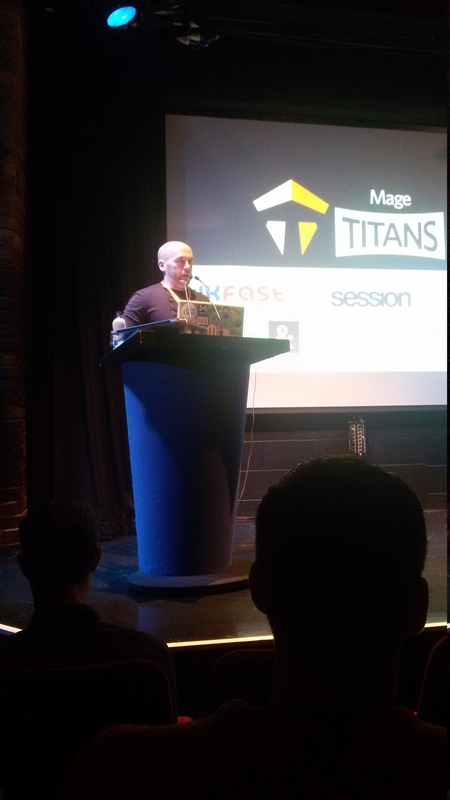 As he couldn’t make it, Dave Hitchen jumped in and his talk was named the opposite Why I want to be a Magento developer. 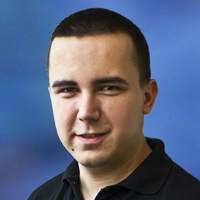 He explained us why he chose Magento and he compared it with a few other platforms. The things he liked the most about Magento were modularity and extensibility. At the end Dave asked the audience for some advice and everyone gave him support. Panel discussion was up next. Ben Marks, Vinai Kopp and Alistair Stead came up to the stage with Tony Brown moderating the discussion. There were questions from Twitter that were previously asked as well as questions from the audience. Some of them were about version control, enterprise and community Magento versions, composer and loads of other stuff and it was very interesting to hear from Magento community leaders on these topics. One of the most anticipated talks was Magento on HHVM by Daniel Sloof. I mentioned Daniel in my Meet Magento Switzerland review where I found out that he has been contributing to HHVM project mostly by submitting patches that were fixing stuff that prevented Magento from working on that engine. After some basic introduction, Daniel explained the sorting problem which was especially important for Magento. It seems that PHP Zend Engine and HHVM have different behaviour when it comes to sorting, so Zend Engine native sorting had to be turned on for Magento to work. Currently both Community and Enterprise versions of Magento pass the Magento Test Automation Framework with near 100%. It’s important to note that other caching extensions don’t get in the way of HHVM so it wouldn’t be a problem to use them. At the end there were a few words about Hack language which is basically a PHP statically typed language made also by Facebook. One interesting project was HipHopIndexer that takes only indexing part of Magento to HHVM. The Final talk by the name How’s things was given by Ben Marks. It was roughly the same concept as in Zurich conference with audience getting the updates on different Magento related topics. Amongst these were founding an Advisory Board, improving Github usage on Magento 2, fixing Magento Connect which were all set to be done in near future. Magento documentation will also be on Github so everyone will be able to contribute. Jon Woodall gave the closing talk and we went to Ark Bar where the after party was held. Sounds like a lot of fun, sad that I couldn’t attend. As a (mostly) frontend Magento developer, I am very interested in the RWD movements in the community, and the increasing number of talks about moving otherwise “dynamically generated” parts of Magento onto the client side for even more interaction (eg: passing data to the client for Backbone.js models). It’s exciting to see the quality of design principles that have long powered the backend of Magento now being introduced to the frontend.